The bone gatherers found in the annals and legends of the early Roman Catholic Church were women who collected the bodies of martyred saints to give them a proper burial. They have come down to us as deeply resonant symbols of grief: from the women who anointed Jesus’s crucified body in the gospels to the Pieta, we are accustomed to thinking of women as natural mourners, caring for the body in all its fragility and expressing our deepest sorrow. But to think of women bone gatherers merely as mourners of the dead is to limit their capacity to stand for something more significant. In fact, Denzey argues that the bone gatherers are the mythic counterparts of historical women of substance and means-women who, like their pagan sisters, devoted their lives and financial resources to the things that mattered most to them: their families, their marriages, and their religion. We find their sometimes splendid burial chambers in the catacombs of Rome, but until Denzey began her research for The Bone Gatherers, the monuments left to memorialize these women and their contributions to the Church went largely unexamined. The Bone Gatherers introduces us to once-powerful women who had, until recently, been lost to history from the sorrowing mothers and ghastly brides of pagan Rome to the child martyrs and women sponsors who shaped early Christianity. It was often only in death that ancient women became visible through the buildings, burial sites, and art constructed in their memory and Denzey uses this archaeological evidence, along with ancient texts, to resurrect the lives of several fourth-century women. Surprisingly, she finds that representations of aristocratic Roman Christian women show a shift in the value and significance of womanhood over the fourth century: once esteemed as powerful leaders or patrons, women came to be revered (in an increasingly male-dominated church) only as virgins or martyrs figureheads for sexual purity. These depictions belie a power struggle between the sexes within early Christianity, waged via the Church’s creation and manipulation of collective memory and subtly shifting perceptions of women and femaleness in the process of Christianization. 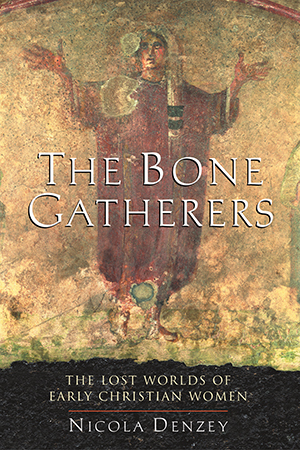 The Bone Gatherers is at once a primer on how to “read” ancient art and the story of a struggle that has had long-lasting implications for the role of women in the Church.